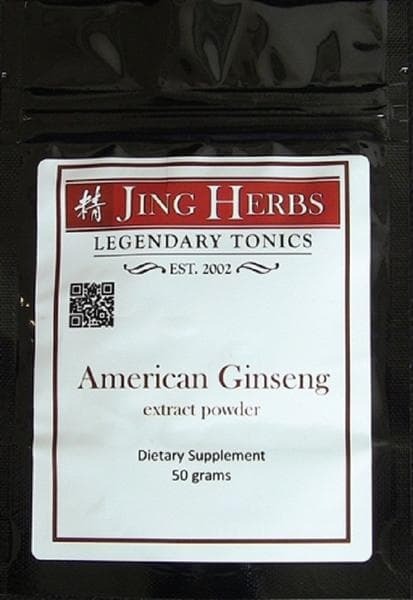 American Ginseng increases day to day energy, replenishes vitality, and supports Lung function. Even though it is grown in North America, it is a true Ginseng. However, unlike its Asian cousins, it's actually cooling in nature rather than being warm or hot, making it a suitable energy tonic for those that are sensitive to the more warming ginsengs. It is highly prized as an adaptogenic herb suited for those that are under stress and show signs of heat, as it will cool and vitalize at the same time. It is also perfectly suited for woman after child birth and during menopause as it helps to maintain healthy hormone levels. Ideal for: This is a health and longevity tonic that anyone can benefit from taking. Usage: 2 grams (approximately 1 tsp.) two times per day. Mix with warm water and drink as a tea. Add to smoothies or shakes if desired. Can be taken any time throughout the day. 2 gm (approximately 1 tsp) two times per day. Mix with warm water and drink as a tea. Add to smoothies or shakes if desired. Can be taken any time throughout the day. 50 gm packet, 25 servings per packet.